This is a nice spring detoxifying foot scrub that I adapted from Floricopeia. 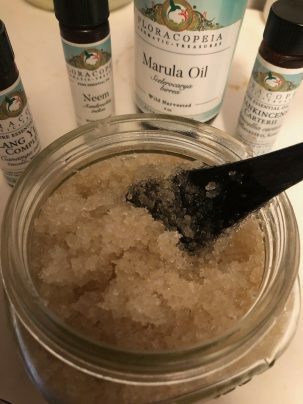 It is my favorite foot scrub/bath after gardening, hiking, or any a busy day — it gently scrubs the garden dirt (or maui mud!) off your feet. Neem is it’s star ingredient. Neem, known as the “noble tree” is a star in Ayurveda and has long been used for many purposes in India. It is especially good for hair and scalp, teeth, skin, preventing infections and repelling bugs. Mix together sugar and salt, stir in hydrosol. In a small bottle combine essential oils, then combine essential oils into carrier oil. Then stir the oil mixture into the salt mixture. Scoop out a nice handful; gently scrub and massage feet. Pay special attention around the ball of foot, between toes and heels.